Today I thought we would look at a simple star-shaped spread for keeping love alive in a relationship. It’s called The Love Star both because of its shape and because it invokes the qualities of the Star card in terms of hope, grace and wishes coming true. The card at the centre of the star represents the state of the relationship. With the 6 of Cups here, I would say that these two are in a soul mate relationship. Now, this doesn’t necessarily mean that things will be rosy from hereon in but this couple is destined to be together in this life time. Not everyone will have the 6 of Cups as the soul mate card but I do and it works for me. The card to the left of the central card represents the other person’s needs and the card to the right of the central card represents the needs of the seeker. The card at the top of the spread is symbolic of what the seeker can do to keep the love alive and the card at the bottom of the spread tells us where the relationship is heading. This is not necessarily set in stone but with a Major Arcana card in this position, it is more likely that things will manifest a certain way. Here we can deduce that the other person in this relationship needs time to contemplate what is going on. Things might have happened more quickly than he/she is comfortable with. He may also be on a personal journey of spiritual transformation and realignment which requires him to be still and wait for answers and direction. The seeker just seems to be generally happy to be with ‘the One’. Both are highly intuitive at this point in time as the Hanged Man is associated with Neptunian energies as well as the Water Element and the 9 of Cups corresponds to Jupiter (expansion) in highly psychic Pisces (ruled by Jupiter/Neptune). What the seeker can do is be aware of the ongoing soul alchemy (Temperance). There is a need for further healing on a spiritual/emotional healing and there may be a need for moderation on a more mundane level too. Perhaps they are celebrating their love with an over-abundance of fermented grape juice. This is not normally a conclusion I would make based on the presence of the Temperance card alone, but with the presence of all these Water cards (especially the 9 of Cups), it is a very real possibility. 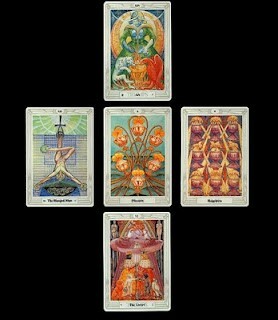 The outcome does look rosy with The Lovers here but let us not forget that a choice may be called upon with this card. These two are dreaming something new into existence… Where will it take them? Perhaps sacrifices need to be made, something which could be on the mind of the seeker’s partner with The Hanged Man representing his needs. Don’t be afraid to pull an additional card for guidance or if you feel that you are not happy with where the relationship seems to be going. Be clear what the extra card is for before you pull it though. Is it additional advice on an action to take to keep the love alive or do you perhaps need additional insights into your own needs. Try to sense how your energy is flowing before pulling the extra card. Is there an equal flow of give and take or is there an imbalance? Look at the elemental balance in the spread and try to get a sense of how the energy is flowing through and radiating out from the central card. Additionally, feel free to consciously choose the cards you wish to see for each position in the Love Star. Place the cards on your altar or photocopy your ideal layout, laminate/frame it and place it on your wall.